Summary: Your initial reaction to Bill Bryson's reading of "A Walk in the Woods" may well be "Egads! What a bore!" But by sentence three or four, his clearly articulated, slightly adenoidal, British/American-accented speech pattern begins to grow on you and becomes quite engaging. You immediately get a hint of the humor that lies ahead, such as one of the innumerable reasons he longed to walk as many of the 2,100 miles of the Appalachian Trail as he could. "It would get me fit after years of waddlesome sloth" is delivered with glorious deadpan flair. By the time our storyteller recounts his trip to the Dartmouth Co-op, suffering serious sticker shock over equipment prices, you'll be hooked. When Bryson speaks for the many Americans he encounters along the way--in various shops, restaurants, airports, and along the trail--he launches into his American accent, which is whiny and full of hard "r"'s. And his southern intonations are a hoot. He's even got a special voice used exclusively when speaking for his somewhat surprising trail partner, Katz. In the 25 years since their school days together, Katz has put on quite a bit of weight. In fact, "he brought to mind Orson Welles after a very bad night. He was limping a little and breathing harder than one ought to after a walk of 20 yards." Katz often speaks in monosyllables, and Bryson brings his limited vocabulary humorously to life. One of Katz's more memorable utterings is "flung," as in flung most of his provisions over the cliff because they were too heavy to carry any farther. The author has thoroughly researched the history and the making of the Appalachian Trail. Bryson describes the destruction of many parts of the forest and warns of the continuing perils (both natural and man-made) the Trail faces. He speaks of the natural beauty and splendor as he and Katz pass through, and he recalls clearly the serious dangers the two face during their time together on the trail. 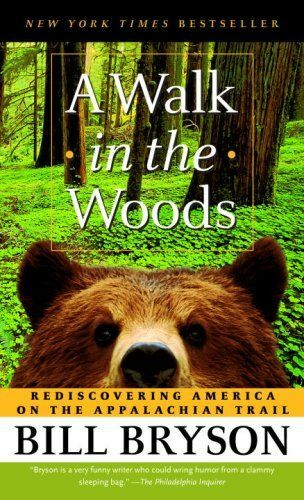 So, "A Walk in the Woods" is not simply an out-of-shape, middle-aged man's desire to prove that he can still accomplish a major physical task; it's also a plea for the conservation of America's last wilderness. Bryson's telling is a knee-slapping, laugh-out-loud funny trek through the woods, with a touch of science and history thrown in for good measure. (Running time: 360 minutes, four cassettes) "--Colleen Preston"
Summary: In the world of contemporary travel writing, Bill Bryson, the bestselling author of "A Walk in the Woods", often emerges as a major contender for King of Crankiness. Granted, he complains well and humorously, but between every line of his travel books you can almost hear the tinny echo: "I wanna go home, I miss my wife." Happily, "I'm a Stranger Here Myself" unleashes a new Bryson, more contemplative and less likely to toss daggers. After two decades in England, he's relocated to Hanover, New Hampshire. In this collection (drawn from dispatches for London's "Night & Day" magazine), he's writing from home, in close proximity to wife and family. We find a happy marriage between humor and reflection as he assesses life both in New England and in the contemporary United States. 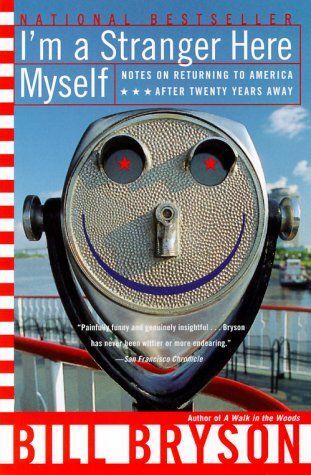 With the telescopic perspective of one who's stepped out of the American mainstream and come back after 20 years, Bryson aptly holds the mirror up to U.S. culture, capturing its absurdities--such as hotlines for dental floss, the cult of the lawsuit, and strange American injuries such as those sustained from pillows and beds. "In the time it takes you to read this," he writes, "four of my fellow citizens will somehow manage to be wounded by their bedding." The book also reflects the sweet side of small-town USA, with columns about post-office parties, dining at diners, and Thanksgiving--when the only goal is to "get your stomach into the approximate shape of a beach ball" and be grateful. And grateful we are that the previously peripatetic Bryson has returned to the U.S., turning his eye to this land--while living at home and near his wife. Under her benevolent influence, he entertains through thoughtful insights, not sarcastic stabs. " --Melissa Rossi"